Maintain regulatory compliance with a custom walk in cooler. 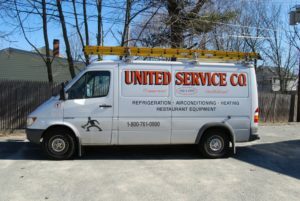 North Shore has access to the best refrigeration professionals at United Service Co. Our Massachusetts-based business started in 1953. As a family owned and operated business, we understand the importance of personal relationships, expert advice, and honest transactions. Count on us to deliver fast, competitively priced, and complete support for your walk in cooler in North Shore. Schedule an appointment today. Walk in coolers keep food, medicines, flowers, and other temperature-sensitive items at the perfect temperature for maximum preservation. If your business relies on walk in coolers, you need a service partner that understands the importance of refrigeration in your industry. At United Service Co., our team is EPA-approved and certified in refrigerant recovery. We can handle all your purchasing and service requests for a walk in cooler in North Shore. Don’t let downtime stifle your business and dissatisfy customers. Reliability matters in refrigeration, and we deliver peace of mind. Whether you schedule a new-build project with us or call in the middle of the night for an emergency repair, we will do our best to keep your business running strong. When it comes to your walk in cooler in North Shore, we’ll help you reach your current and long-term goals. Customers come to us in every stage of the business life cycle. Some acquire new locations and need help updating a walk in cooler in North Shore for new business needs. Others want to build a new facility and need a custom cooler creation. Regardless of your request, we have you covered. As an end-to-end shop, we can design, construct, install, maintain, and repair all kinds of refrigeration equipment. Do you need a walk in cooler to pass a health inspection or meet specific green-building qualifications? At United Service Co., we understand that our customers’ needs vary widely. From saving money to going green, our design inspiration comes from the business outcome you expect. We can deliver a walk in cooler in North Shore created per your specifications. Read more about our design and build services. After installation, businesses rest easy knowing they have a built-in service partner. Our experienced technicians will work on any walk in cooler in North Shore, whether we installed it or not. As a go-to resource for preventative maintenance and repair work, we work on every major refrigerator make and model. Count on us to put over 100 years of collective experience to work for you on any HVAC-R job. We frequently partner with hotels, hospitals, and restaurants as a one-stop shop for appliance, refrigeration, and HVAC support. Our state-licensed business does it all so you can make one call when things go wrong. From 24/7 emergency services to personalized preventative maintenance plans, you’ll find everything you need when you partner with United Service Co. For a better experience with a walk in cooler, North Shore businesses can reach our team at (800) 761-0900 or (978) 750-5600.